Gimme Shelter … No! How About an Injunction? On Thursday, June 15, the Lu'ma Native BCH Housing Society delivered Notice Pursuant to the Trespass Act to Ten Year Tent City (TYTC) at 950 Main Street, demanding evacuation of the site "by no later than 7:00 a.m. on Friday, June 16, 2017." That point in time has come and gone. TYTC remains on site. The next day, TYTC received injunction notice from Lu'ma, set for a BC Supreme Court hearing on June 21. Backstory: TYTC came into being on April 28 and has existed for seven weeks. On May 17 the BC Supreme Court rejected a City of Vancouver application for injunction. The question mainstream media seems unlikely to touch is: exactly who or what is Lu'ma Native BCH Housing Society, and why is this corporate entity fronting for the City of Vancouver in an attempt to displace TYTC? If you do the web search thing, you find a web site for Lu'ma. So the org does exist … sort of. The site stays excruciatingly vague about the real people involved. The main page offers these frustrating evasions: "guided by a volunteer Board of Directors … the Society is headed by a CEO." Further poking about does not get far past this shield of impersonality — a strange contrast to my own experiences with Indigenous people. 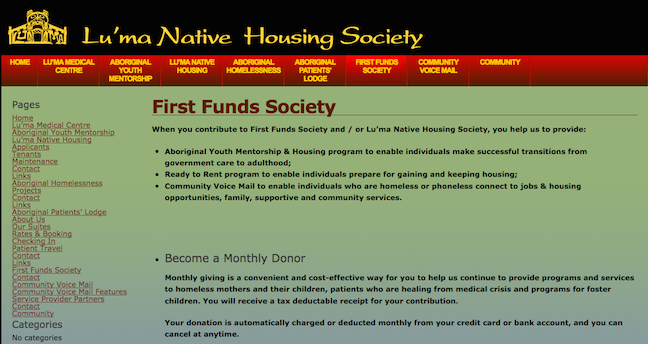 An essential clue turns up under First Funds Society, which seems to be the funnel through which "charitable" money can be taken in by Lu'ma. A generic name like that seems designed to hide personality and purpose. Fortunately, those words do not serve to shelter the organization from discovery through a search in the Canada Revenue Agency's List of Charities. First Funds Society has existed since 2003, and its latest annual reporting period ends 2015-12-31. 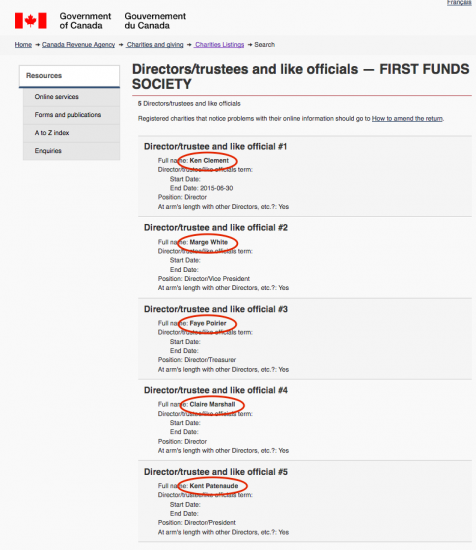 The only real interest of this shell within a shell is to get at the names of directors, listed as these five persons: Ken Clement, Marge White, Faye Poirier, Claire Marshall, and Kent Patenaude. Why would this information not be provided directly on the Lu'ma web site? After that, the job turns into web hacking on these five names in order listed. The nature of that task precludes complete certainty that this person is also that person, but probabilities are high that the following data is correct. The gathered information shows a convergence of tight affiliations to all levels of the state (federal, provincial, municipal) that fights tooth and nail to hold onto stolen native land. Beyond that? Multiple personal connections to agencies of repression (Vancouver Police Department, Ministry of Children and Family Development) and resource exploitation (TransCanada, Enbridge, BC Hydro). Just the sort of crew to be conscripted into displacing Ten Year Tent City and its significant component of Indigenous residents. One group has money and power; the other has little more than a tent to be pushed off onto a sidewalk somewhere else. Ken Clement is a former Vision Vancouver school trustee. Bingo. Vision Vancouver, the civic party that runs City Hall, fails to oust TYTC on direct challenge, so it calls in a familiar lackey. Marjorie White shows statist connections that include Order of British Columbia and "first Aboriginal person appointed to the Vancouver Police Commission." Claire Marshall of the Vancouver Police Board "specializes in Aboriginal engagement and community development" and "has worked for BC Hydro, BC Transmission Corporation, TransCanada Pipelines and the First Nation Energy and Mining Council, with a clear focus on meaningful First Nation consultation." Say no more. Kent Patenaude shows on Linked-In as "Senior Aboriginal Relations Lead at TransCanada." 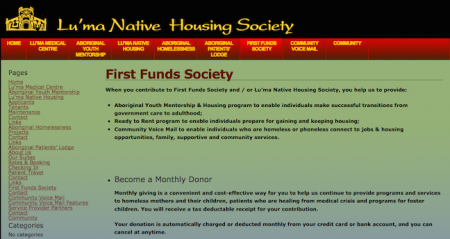 A June 2015 CBC news article names Patenaude as "Luma Native Housing Society president." A January 2012 Tyee article names Patenaude as an agent for the Enbridge pipeline. Why do these five people make themselves so hard to connect with Lu'ma? Are they ashamed of what they do? Do they think they have privacy to protect? Why would they seek anonymity behind a corporate moniker?